Native to South America, tomatoes were brought to Europe in the 1500s by Spanish conquistadors. Most Europeans believed tomatoes were poisonous, hence their genus name, Lycopersicon, which means "wolf peach." Today, tomatoes are the most frequently grown vegetable in home gardens, according to Judy Sedbrook, Master Gardener at Colorado State University Cooperative Extension Office, and with good reason. Homegrown tomatoes taste nothing like their mushy store counterparts and grow well in most areas of the United States. Use them fresh or in salsas and sauces. Prepare garden soil by spreading a 1- to 2-inch layer of compost or manure over your garden area with a rake. Shovel into the soil 6 inches, turning the soil over to loosen clods and mix the compost or manure into your soil. Lay a sheet of black plastic over your soil two to three weeks before planting. The black plastic warms up the soil and tomato plants grow more quickly. Plant your tomatoes two weeks before the last frost. Plant your tomatoes in a hole deep enough to cover the peat pot by 1 inch. Exposed peat pots dry out quickly, absorbing water from the soil. Pour 1 cup of starter solution (diluted according to package directions) around each plant. Scatter 3/4 cup of lime around each tomato and work in gently with a hoe. Lime prevents nutrient imbalances and reduces the chance of blossom end rot. Protect your tomato plants from wind and cold nighttime temperatures. Cover young plants with self-standing plant protectors (Wall O' Waters) or cut the bottom off of an empty plastic milk jug and place the jug over the tomatoes. Remove the protection once nighttime temperatures are consistently above 65 degrees F.
Check your tomatoes daily for moisture. Tomatoes need evenly moist soil, so water them before the soil feels dry. Water slowly using soaker hoses or turn your hose on to just a trickle. Tomatoes that have received too much water, too quickly, may crack. Additionally, when tomatoes go through cycles of drought followed by plentiful water, they don't bear as well and are more prone to diseases. Stake or cage your tomato plants after you remove the frost protection. Buy 6-foot stakes or tomato cages at a nursery. Drive stakes or tomato cages into the ground to a depth of 12 inches. Attach tomato plants to the stake by tying a soft rope around the tomato and the stake, allowing 3 to 4 inches of slack. Choose early harvest tomatoes. (The plant tag will say that plants mature in 50 to 60 days, as opposed to 75 or 80). These tomatoes will grow and produce faster than long season tomatoes. 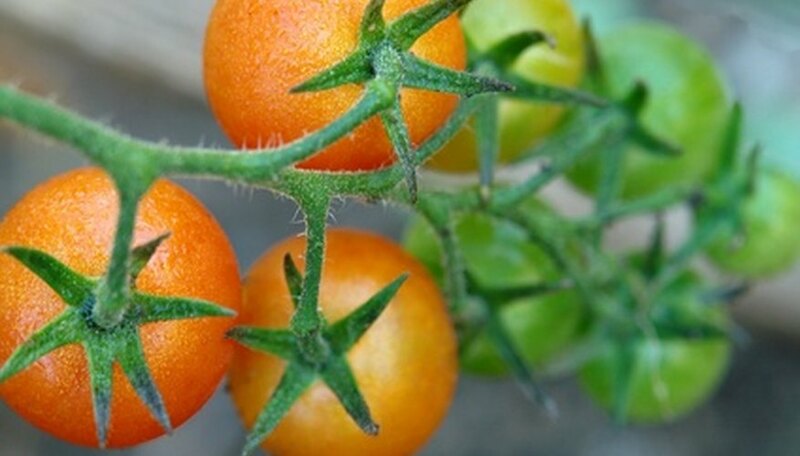 Choose tomato types with a good track record of successful growing. Popular hybrid types include Better Boy, Whopper, and Celebrity. Look for the VFN symbol which means the plant is resistant to several diseases. Buy large, healthy plants for faster growth. Avoid plants that are leggy or spindly. Wall O' Water is a commercially produced plastic ring that fits over young tomato plants and forms a tent shape. Fill the pockets with water that collect heat from the sun to protect plants from chilly nighttime temperatures. Find them at nurseries and garden stores. If you choose not to protect plants from frost, wait until after the last frost before planting. Planting a bit early, though, produces tomatoes faster. Some bush varieties don't require staking or caging.